Instructor User Guide StatisticsHow do I view summary reports in the Statistics tool? Summary reports are displayed on the Statistics tool landing page for Visits, Activity, and Resources. Visits: Total number of site visits. Users who have visited site: Total number of distinct users that visited the site. Site members: Total number of users that are member of the current site. 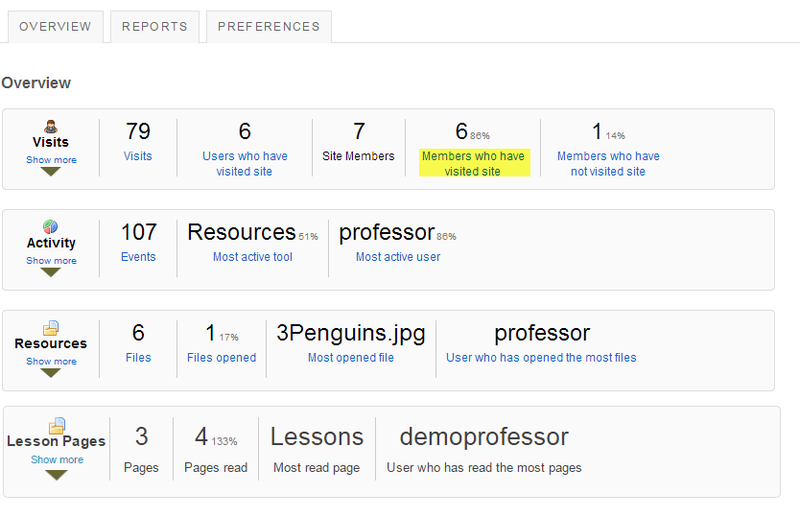 Members who have visited site: Total number and percentage of users that are site members and have visited the site. This number may be different from Unique Visits if there are visits from users that are no longer members of the site. Members who have not visited site: Total number and percentage of users that are site members and have not visited the site. Average presence time per visit: Average time an user stays present on the site, per visit. Events: Total number of site activity events (from the list specified on the tool Preferences page). Most active tool: The tool that generated most events (from the list specified on the tool Preferences page). Hovering the mouse over the value will display the full tool title. Most active user: The user that generated most events (from the list specified on the tool Preferences page). Hovering the mouse over the user EID will display the full user name. Files: Total number of existing site files (folders excluded) from the Resources tool. Files opened: Total number and percentage of site files (folders excluded) from the Resources tool that were already opened for reading. Most opened file: The site file (from the Resources tool) that were most opened for reading. Hovering the mouse over the value will display the full resource file name. User who has opened the most files: The user that opened most site files (from the Resources tool) for reading. Hovering the mouse over the user EID will display the full user name. Note: A more detailed report can be obtained by clicking on any of the items above (e.g., clicking on Members who have not visited site will display a report of all site users that never visited the site). Clicking the Show more/less link will expand or collapse the Visits report. The act of entering a site is considered a site visit. 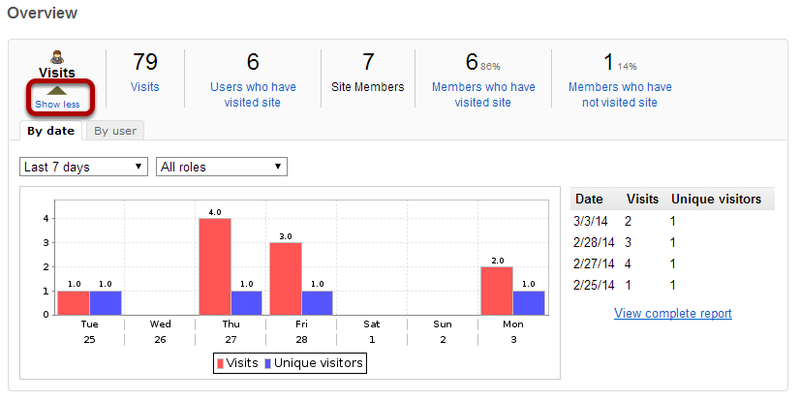 Clicking the Show more link will present a chart and table view for a quick view of visits statistics. Clicking By date or By user will group statistics by date or user, respectively. Selecting Since site creation, Last 365 days, Last 30 days or Last 7 days will filter statistics accordingly. Clicking on the chart image will produce a maximized version of the image. Clicking on View complete report will display the full data for the current displayed statistics. Note: On the same login date, if an user enters/exits the same site multiple times only one visit will be recorded. Clicking the Show more/less link will expand or collapse the Activity report. Events generated by tool actions (e.g., new chat message, resource opened, etc.) are considered activity. Clicking the Show more link will present a chart and table view for a quick view of activity statistics. Clicking on By date, By user or By tool will group statistics by date, user or tool, respectively. Clicking the Show more/less link will expand or collapse the Resources Overview report. Any file/folder item related activity (new, open, edit or delete) will display in this report. 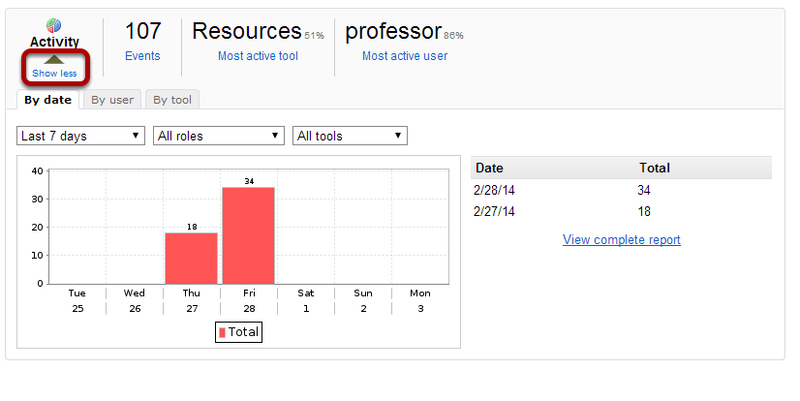 Clicking on Show more link will present a chart and table view for a quick view of resource activity statistics. Clicking on By date, By user or By resource will group statistics by date, user or file, respectively. Note: On the Overview page, resource statistics refer to files from the Resources tool only. Clicking the Show more/less link will expand or collapse the Lesson Pages Overview report. Any Lesson-related activity will display in this report. 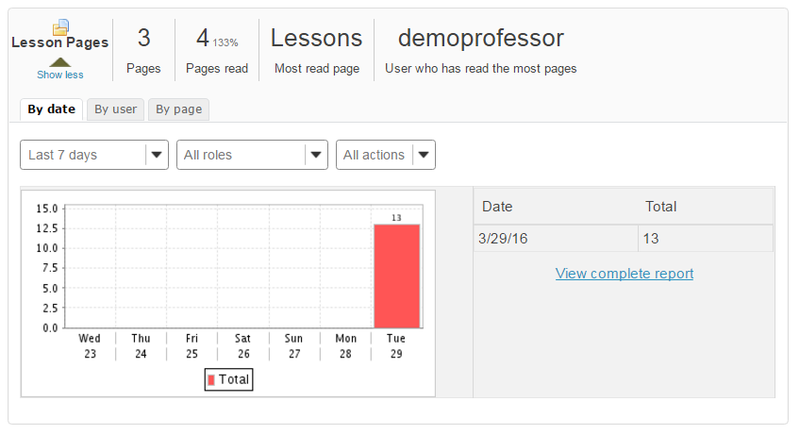 Clicking on Show more link will present a chart and table view for a quick view of Lessons activity statistics. Clicking on By date, By user or By page will group statistics by date, user or page, respectively. Prev: What is the Statistics tool? Next: How do I create and run a report?